When the all-new Sentra arrived for our weeklong test, we were delightfully surprised by its new upscale appearance. In fact, if it weren’t for the Nissan grille and emblem we thought we were looking at a Lexus; it’s that nice. Compared to the previous design, Sentra’s beltline has been lowered and a new character line has been added that runs from the front fenders to the sculpted taillights. The 2013 Sentra is built on a new platform that is lighter than the previous iteration, contributing to the new model’s more than 150-pound weight reduction and helping it get better mileage. 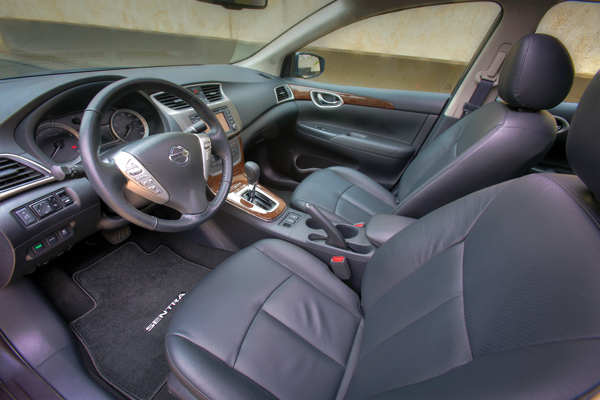 Sentra’s sophisticated new look continues inside with a high-quality interior design and materials, including a soft-touch instrument panel and door armrests. Even though the car is only 2-inches longer, there appears to be a lot more legroom, both front and back. Power comes from a 1.8-liter 4cylinder engine that produces 130-horsepower and is controlled by a CVT –continuously variable transmission. It may be slightly underpowered, but fuel mileage of 30-city and 39-highway make up for the shortcoming. Overall, we think the all-new Nissan Sentra is a top pick. Starting at $15,990, excluding delivery, we’re giving it 5 out of 5 stars. 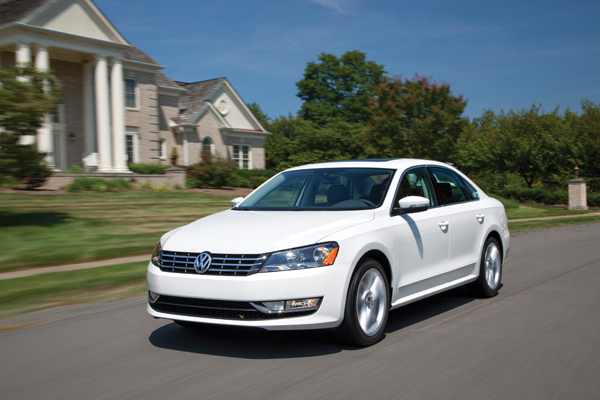 Designed and built in the U.S., the Passat is probably the most un-German car in the Volkswagen lineup. Touted as a great sedan and with big sales numbers, we ended our weeklong test drive expecting Champaign and caviar but were handed – in our mind – a soda and saltines. Passat’s uber-conservative exterior styling, with its straight lines on all four sides, didn’t give us much to talk about and the interior, with its leatherette upholstery, did little to excite the senses either. At least the taillights had a little flair. Other positives include plenty of rear seat legroom and a huge trunk. The 170 horsepower 2.5-liter 5-cylinder engine paired with a six speed automatic transmission was timid leaving the stop light and the front suspension wasn’t dampened enough for our taste, especially when travelling across Houston’s undulating concrete. We counted no fewer that 14 engine and trim models available that started at $20,845, but our mid-pack SE model, with sunroof and navigation along with floor mats and shipping charges, stickered for $28,025. For 2014 Volkswagen decided to drop Passat’s 2.5-liter power plant and replace it with a 1.8-liter 4 cylinder turbocharged affair. We think that will help.